M2 Initially Felt Porting Streets Of Rage 2 To 3DS Was "Impossible"
"We just didn’t know if we could pull it off"
This week sees the western launch of 3D Streets of Rage 2, the latest in Sega's line of 3DS-based 3D Classics. It's one of the most beloved games of the 16-bit era, and also one of the most technically impressive Genesis / Mega Drive titles seen so far. In fact, the game is such a potent showcase of the console's abilities that developer M2 initially told Sega that it would be impossible to port to the 3DS with 3D effects and local multiplayer enabled. NH: I told him, "It's impossible!" YO: He said it wouldn't work because the Mega Drive requires too much processing power. NH: That's right. It takes a lot of resources to emulate the Mega Drive, and adding stereoscopic 3D requires even more on top of that. YO: And then there's Streets of Rage, which was Batch 1's final title, meaning that it was an incredibly hard game to develop. Sonic the Hedgehog, Altered Beast, Ecco the Dolphin, and Shinobi III were all pure horizontal side-scrollers. So we wanted to have a beat'em up, and Streets of Rage is visually perfect for a stereoscopic 3D treatment. The end product really makes you go "Now THIS is 3D! ", but at the time, M2 wouldn't go for it. NH: We just didn't know if we could pull it off. YO: It's a linear game, so I tricked him by saying, "All you need to do is add depth to the beginning of Stage 1, and then it's just copy and pasting from there!" NH: "As if it's going to be that easy," I thought. But we got it done, thanks to our experience with the previous seven games. YO: There were spots where we had to manually convert parts to 3D where we couldn't copy-and-paste, like the elevator on Stage 7, but in the end, the floors in these beat'em ups just look great in 3D. Also, we wanted to be sure to have Local Play, so we put in multiplayer the same way we did with the Game Gear Virtual Console games. But there was a problem with implementing Local Play for Streets of Rage 2: it runs at 60 fps. NH: The characters are huge, and the wireless play runs at 60 fps? Streets of Rage ran at 30 fps, so we figured it wouldn't be too hard to keep up with at 30. But Streets of Rage 2 was tightly made. I mean they squeezed every bit of juice out of the Mega Drive on that one. It just oozes with the spirit of "Let's put everything we can in," so we knew that bringing it to the 3DS would be a real challenge. NH: Converting Streets of Rage into 3D as a huge undertaking, and the programmer in charge of the stereoscopic 3D work was at it nonstop for a month or two. When the project was over, he said, "I've worked 48 hours every day. I deserve a vacation. Basically, I'm going to drop off the radar for two weeks." He first working on the 3D conversion of Sonic The Hedgehog, all while giving Streets of Rage a lot of thought as to how he was going to do it. With Sonic The Hedgehog setting the bar, it really put the pressure on everyone to deliver. He was very influential on the quality level we strive for in the Giga Drive 3D conversions. After those two weeks of rest, he came back, and as if turning in his homework over summer vacation, he handed over this program he'd been working on over his break. It was the entire first stage of Streets of Rage 2 in 3D. Putting aside the fact he didn't actually take a break (all laugh), he had gone and made this. It was running on the PC, and while we weren't sure we could squeeze down the processing to fit, not only did the diagonally scrolling bits work, it looked really cool. YO: Everyone was shocked. I mean, the games for the second batch had already been chosen and locked in. He must've have believed we were going to do more. NH: Who knows? I'm thinking that he did it because people said it couldn't be done. He's that kind of guy. YO: So then back in the fall of that year, Horii-san stops by and hands me some 3D glasses and says, "Hey, check this out." And there it is. Streets of Rage 2 working in a development environment. (all laugh) He's like, "Hey, check out this diagonal action!" (laughs) "Horii-san, you said it couldn't be done, but here it is!" 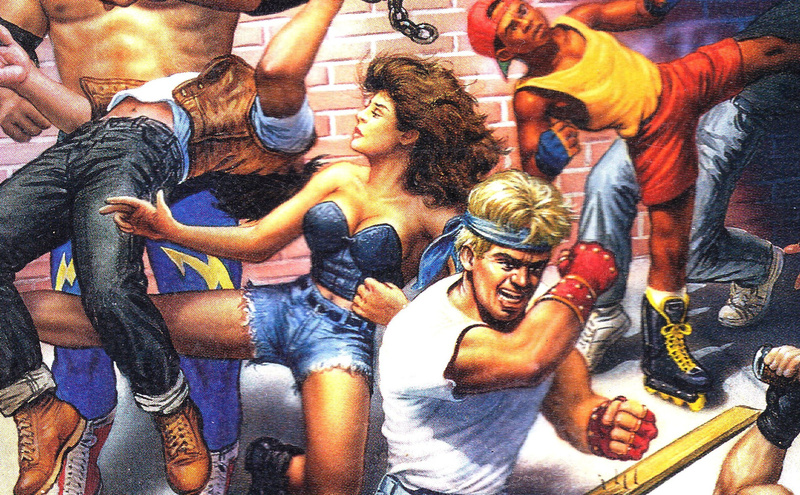 3D Streets of Rage 2 launches this week on the 3DS eShop. Be sure to check out our initial impressions here. The Sega Blog interviews with Yosuke Okunari and Naoki Horii are a great read. you don't realise how much blood, sweat and tears went into getting those games on the 3DS. M2 are just a fantastic company! I hope they keep going and do more! And this blood, sweat and tears these people put into their games really really show. The first Streets of Rage looks like a freakin Pop-Up book, its amazing. And the fun thing is, those arent "just" ports, some of these games are even better then their arcade origins. @shaneoh Its not really compareable. The ambassador games for instance ran in DS mode with some left over GBA compatibility. It kinda works, but it doesnt offer any additional features, such as savestates, game suspension or even the regular OS overlay. Its merely a workaround and not on par with the quality of other VC games. What M2 does is turn these games into new ones pretty much. Its not just emulation. Great interview! Fans tend to be ignorant to all the sweat and hard work that goes into making games, even 3D Classic ports like this. They've really been on a roll, the only force driving the 3DS VC forward! I hope they might be able to churn out some more of my favorites, like shining force 2 and phantasy star (which would look amazing in 3D). This is what i'm talking about sega,stop wasting time and resources on mobile and start getting back to the quality you are known for , this is like the first day one download for me since i bought the 3ds. I already have multiple copies of Streets of Rage, but suddenly find myself wanting these two 3D Classics, purely for the amount of effort put into the ports. I love these M2 interviews, they always begin with M2 saying it's impossible, it can never be done and then ends with them doing it! Really looking forward to SoR2 in 3D! At first I thought this is bullcrap. You can't tell me a 16 bit game can't run in the 3ds. After reading that I now realize all the hard work that goes into this and appreciate it more. With that said I've never been a Saga fan and only own one of the 3d classic games (which I like) but because of this interview I now need to see this game running on my 3ds. I do think that everything Saga is doing with the 3d line is the best classics line on the system period. That 3d just looks so good and gives the games a whole new look and appeal. Am I now a Saga fan? Not just yet but if I like this who knows what else I'll try! I wanted this a week ago, I just can't stand the wait!!!!! I'm buying stuff like Azada, that's how starved I am for eshop stuff. Doesn't help that Nintendo totally quit trying after 3D Urban Champion to scratch the 3D itch many gamers have. Now we just need enough people to play this, so we can get the 3rd SoR! I don't think the Streets of Rage games are nearly as good as people claim they are but I buy all of these games because I like that Sega and M2 are actually trying. I wish we could get more 3D conversions of various Arcade/SNES/etc... games from other companies. Does anyone know if there's an infinite continues option, like in the first one on the 3DS? That's a great read. Kudos to the guy who made this work. SoR2 was one of my favorite Genesis games, and I can't wait to play the version they worked so hard on. @Ootfan98 ahh mate i wish they'd bring your avatar out on 3DS & Wii U i'd them in a second. @XyVoX I was gutted when they stopped the C64 VC without releasing it. I'd like to buy the Programmer who rebuilt the first stage a Pint. That man is a hero right there. Cheers! the M2 ports are the best thing to come out of Sega right now (maybe Total war aswell). This is the Sega I love & remember!! Thanks guys....but only thing is...where's the wii u love already?? @Spoony_Tech just curious...how can you be an avid gamer and not be a fan of sega? I just don't like the New sega. But They got piles & piles of classics they're sitting on!! I wish they'd post them all on the current gen systems already!! I'll even take a compilation disc like they had on 360/ps3!! @joey302 It's simple really, I've been playing Nintendo since the NES days and been more of a fan of that style of game. I've played most of the Sonic's and various other games but never really did care for them. Had a Master System and thought the games were awful. Genisis was a huge step up (never owned one but where I worked as a teen it was played daily) but even then there was still a few games I even bother to play that I thought were good. So am I a Nintendo fan boy only, no. I've had every PlayStation up to 3 and fully enjoyed each one. Had an Xbox as well and I also thought the Dreamcast was a great system but by then Sega was already done for. Even owned a Saturn day one and Dreamcast. I'm just not a fan of Sega specific games. It was more for the 3rd parties for me. For instance on the Dreamcast my 2 favorite games were Code Veronica and Soul Caliber. I did like their sports line up though throughout Sega's history. Problem is now those games are not classic anymore as they are severely outdated. Lol I just didn't wanna miss a great game only cause I didn't own a certain system. Grabbing this asap. Hopefully SOR 3 will be possible as well. This will be downloaded as soon as it's available. One of my favorite games of all time. @KnightRider666 I hope they keep this Train rolling my friend there is still so much goodness Sega has to offer in the 3D Classics and Virtual Console. I hope it's all 3D Classics though I'm still hoping they might consider giving Shining in the Darkness the 3D treatment. I'm playing it, it was worth the wait!!! After playing, and reading this, I got to say I'm thankful for the M2 team's dedication. Remaking these classic games in 3D is not as easy as some would assume. Here's hopin' we see "Streets of Rage 3" in a year.